Small shops are at the heart of our high streets and town centres. They offer diversity and choice and provide a really personal service to their community. Yet in many communities these independent retailers are under threat. They face a rising burden of regulation and tax, a daily battle against crime and violence, and competition from the growth of out-of-town shopping centres. It is estimated that 2000 shops close every year. Join our campaign to support Britain’s small shops by signing our petition today. In the Summer, Conservative MPs published a report which set out the challenges facing small shops and ideas for the way ahead. It concluded that we must stand up for small retailers and recognise the vital role they play at the heart of our communities. So we are campaigning to promote and save our small shops. In particular we are opposing Labour plans to make it easier for more out-of-town development, by scrapping the so-called ‘needs test’. If implemented, this will further undermine small, town centre shops. You can help save your local shop. Become part our campaign to keep small shops at the heart of our communities. Help us to raise money towards the Fylde Battle of Britain Memorial by simply clicking on the link above before making any purchases on-line. Over 600 retailers are taking part in the scheme and will make a donation to the fund, at no cost to you, if you use the link above. We need to raise £80,000 to build a similar scheme to the one in the picture, which will be the only Battle of Britain Memorial in the North of England. Tell us how best to help new mothers? Maria Miller, Shadow Minister for the Family, has launched an online survey to help with the development of our proposal to provide professional home support to new mothers in the first few days. Maria said "We are looking at adopting the policy similar to that in the Netherlands called Kraamzorg. Maternity nurses come into your home to provide practical and clinical support to help with the extra work that comes with the arrival of a new baby - for example, with breastfeeding, looking after older children and preparing meals"
"It is vital that we can asses the amount of help needed for young mums, especially when they may not have family living close by, there is a fine balance between Nanny State and providing a service so the feedback from this survey will be useful"
The Council has always been keen to capture residents views via a multitude of methods. Listening day, State of the Borough debate and feedback through the website have been the key methods of gathering your feedback, combined with the regular newsletters distributed by Councillors. Recently however we have highlighted the fact that many residents are unaware of many of the good things driven forward in recent years by the Council and the background of some our the challenges being faced not only by the Council but the Borough in general. As part of our drive to improve the information flow we have dramatically opened up access to committee meetings for residents, invested heavily in our website and have continued to invest in the Fylde in Focus newspaper. But there is still more to do! Below I have put a link to the Councils 2008 Annual Report (copy and paste into browser)This document is a small snapshot of some of the issues and facts affecting the Council this year. By being aware of such information along with the Corporate Plan and Community Plan residents can easily see what it is we are doing and why. Caroline Spelman has offered Marc Goodwin a warm welcome to the Conservatives after his defection from the Liberal Democrats. "Whilst the Liberal Democrats are going nowhere and drifting, I believe that the Conservatives are the Party of fresh, new ideas, appealing to people right across the country." "Under David Cameron's leadership more and more people are looking to the Conservative Party to deliver the changes our country really needs." George Osborne, the Shadow Chancellor, described this latest Lib Dem defection as "further evidence" that the Conservatives are taking the lead on progressive issues such as poverty and the environment. The spiralling costs of energy bills is threatening to force almost 2.2 million pensioners into fuel poverty this Winter. The Council is keen to help as many Pensioners as possible insulate their homes and there are many free grants available for the over 70's. There are also 1.2 million pensioners who are not claiming the Housing and other benefits that they are entitled to. Just a quick telephone call to the Town Hall on 01253 658658 and the benefits team will be able to arrange a quick assesment of your entitlements. If you have a parent or grand parent over 60 then please urge them to contact the Council for advise on getting what they DESERVE! Representatives from the motorcycle industry met Transport Minister Jim Fitzpatrick today, to press the industry’s case for a six month delay to the introduction of new test procedures scheduled for the end of this month. The Motor Cycle Industry Association (MCI), the Motorcycle Rider Training Association (MRTA) and Riders Edge (Harley-Davidson rider training) were able to explain their concerns to Mr Fitzpatrick and senior representatives of the Driving Standards Agency (DSA). The call for a delay is also backed by the Institute of Advanced Motorists, the Motorcycle Action Group and the British Motorcyclists Federation. The industry’s concerns are centred on the road safety risks to novice riders who in many cases will be forced to ride long distances in order to take a motorcycle test. There is also a strong business case to delay implementation of the new test. On September 29th the motorcycle test is due to change, introducing new manoeuvres required under a European Directive. The DSA has chosen to implement the directive by concentrating motorcycle tests at about 60 planned multi-purpose test centres around the UK. Currently there are around 260 motorcycle test centres and the DSA plan, if it had been successful, slashes this number by 80%. The motorcycle community call has been prompted by the fact that only 39 test centres, nationwide, will be opened ahead of the major changes later this month. There has been rising concern about the DSA’s inability to deliver the promised number of new test sites. Unless action is taken, there is a real danger that the whole motorcycle test system will fall into chaos, with candidates in many parts of the country unable to secure a motorcycle test. More importantly, the motorcycle industry fears that longer journeys to fewer test centres will bring significant road safety risks. All good advice to novice riders tells them not to undertake long journeys in heavy traffic soon after taking their test, but to build up slowly as they gain experience. Some test candidates could face a journey of 100 miles or more in each direction, coupled with the stress of taking a test. Craig Carey-Clinch added: The motorcycle industry, MRTA and training organisations are fully supportive of the new test, which should help to produce more competent and safer riders. But we believe that if the new test is introduced in a few weeks as planned, the motorcycle test system is likely to crash and administrative chaos will ensue, discouraging people from taking their riding test, and compromising longer term road safety goals. How pensioners are treated is a key test of a society’s fairness. The impact of Gordon Brown’s tax and benefit policies mean Labour is failing on this fundamental yardstick. In addition, new analysis by the Conservative Party reveals that the rising cost of living means over two million pensioners will actually be up to £100 worse off – even after the increase in Pension Credit. Fylde Borough has one of the highest levels of over 50’s in Lancashire and this ticking time bomb will need strong Conservative policies to avert many Fylde pensioners from ending up on the Bread Line in a period of their lives which they should be enjoying. 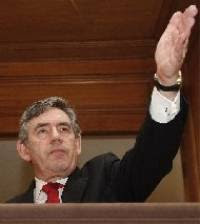 Gordon Brown’s disastrous tax raid on pension funds has slashed £100 billion off the value of Britain’s pension savings. Recently published Treasury documents reveal that Gordon Brown received warnings from civil servants that his tax hike would cut the income of private pension schemes by up to 10%. It cannot be right that Pensioners have to pay tax on their pension payments, Conservatives need to scrap tax on Pensions and Savings. Labour’s increased use of complex means testing of pensioners has resulted in reduced take-up of benefits. 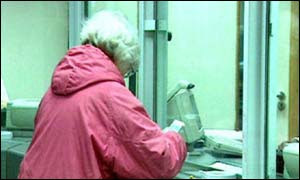 Between 1.2 and 1.8 million pensioners failed to take up their entitlement to Pension Credit last year. rate of older people by gender and selected age groups, February 1997.
pensioners last year. 42% of entitled non recipients of Housing Benefit were living in poverty last year compared with 10% of those entitled to and claiming the benefit. For a typical pensioner, a third of the increase in the basic state pension since 1997 has been eaten up by higher council tax payments. 10 Hansard, 10 January 2008, col. 730W. Figures exclude payments for 70+ year olds, winter fuel payments and the 2005-06 £200 one-off payment; pension. pensioners will be entirely eaten up by higher inflation. Thanks to the spread of means-testing, more pensioners are now dependent on Pension Credit. This means that the Guarantee Credit rise will be entirely eaten up by higher inflation. In fact, in real terms, the value of the Guarantee Credit19 is actually being cut. 12 ONS series CBXR. This is for a one-person pensioner household. 14 ONS series CBXY. This is for a one-person pensioner household. 19 The Standard Minimum Guarantee of the Pension Credit for a single pensioner is currently £124.05 per week, or £9,846.20 per year. For a pensioner couple, it is £189.35 per week, or £6,450.60 per year. Pension Credit is falling by 1.0 per cent in real terms this year (4.2 minus 5.2). 21 For a one-person pensioner household, the rate of RPI inflation was 5.6 per cent. This means that the Pension Credit is falling by 1.4 per cent in real terms this year (4.2 minus 5.6). Lancashire District Leaders met yesterday at County Hall (August 4th) to discuss the costs relating to the Governments Concessionary Bus Travel Scheme. Although accurate figures are still not available, due to computer software problems the "estimated" funding shortfall is projected at £2.3 million. Some are predicting a total bill to Lancashire Council tax payers of up to £7 million. Yesterday saw this story break on Regional and national news and confirmed that Fylde Borough Council was right to see the traevl scheme as a "High Risk"
"The take up of the free bus travel scheme for over 60's has been encouraging, but the slow implementation of software means we are still flying by the seat of our pants, when it comes to knowing just how much of a bill Fylde Council Tax payers could be faced with"
The Council has had to make unpopular decisions to try and keep Council Tax bills down whilst at the same time having available the funding to pay for the Bus Travel Scheme. It is unbelievable that a Government scheme should be paid for by local tax payers - the bill as it stands, threatens to squeeze further the Council's budget and put cash strapped residents under more financial pressure. With this bill now hanging over the Council I hope that residents will see why the funding for the pools had to be stopped for the time being. I will be joining forces with fellow Conservative Council Leaders to lobby Lancashire MP's and Government for a commitment to cough up the funding shortfall. Although I support the basic principles of the scheme, yet again it shows that the funding mechanism for this policy have been ill thought out. There is a consensus that the scheme may cost up to £7 million pounds, in the first year! 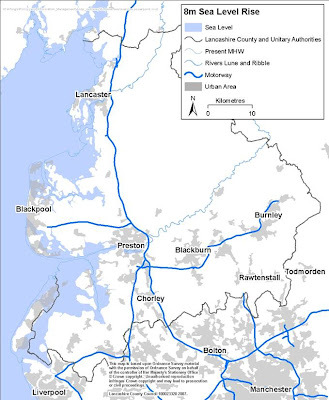 A figure which would bring about swinging reductions in services across Lancashire unless Mr Darling commits to fund the total cost of the scheme. Fylde Borough Council is caught between a rock and a hard place, Conservatives have more ambitious plans for the Borough but whilst this sword of Damocles is hanging over us we are unable to commit revenue funds to any new schemes. Fylde residents will soon have access to their local council via a new service being introduced from 13 August. The Bus will be in Heyhouses Ward on the 27th August at Whalley Place shops from 10:00 until 12 noon. Fylde Borough Council will be using the Local Strategic Partnership (LSP) Community Engagement Vehicle to reach out into the community - starting in the rural areas. This service is intended to give residents access to council staff, who will be on hand to provide information about council services and to listen to issues of concern to the local public. The bus will also offer eligible residents information about the Now Card for free bus travel. The first bus service, based in Kirkham, near Morrisons, will be on 13 August 2008 between 10am and 12pm. Following this, the bus will be located in various places in Fylde every Wednesday throughout August and September. If the service is successful, it is hoped that it will become a regular feature in the Fylde. Councillor Albert Pounder portfolio holder for Customer Relations and Partnerships, said: ”The council is determined to help the public get the information they need quickly and accurately. To this end the bus will complement our existing services delivered by our One Stop Shop and Call Centre. The new bus will offer specially trained staff who will aim to provide a top quality service at the first point of contact”. Cllr Craig Halewood said "This is a great concept for residents in Heyhouses which has some of the highest numbers of elderley in St Annes on Sea. With the closure of all Heyhouses Post Offices it is great to see the Council bringing it's services to the community"
Cllr Keith Hyde added "I hope residents will get in touch with us and let us know if the service has been of use, if it is, I hope that the Council would support the funding for making it a regular service"
Although there are many ways in which residents can find out information about their local area or about the decisions being taken that may affect them, very few either take time to look into the rumours and myths, beyond the chat with a neighbour over the garden fence or a with a friend in the local. Heyhouses Ward Councillors have been keen to lead on keeping residents in touch through our regular "Heyhouses Harrier leaflet" or through this blog. We have been looking at other ways of getting the news out to you and we are pleased that the Council has began a trial period of an "open forum" for residents to ask both Leading members and Officers questions about the facts behind the headlines or the rumours in the street. The forum is located at http://www.fyldelife.co.uk/forum/ Residents can create a profile and are encouraged to ask questions of the Council. The response will be "from the horses mouth" and should show residents that there is always another side to the story, which is often untold! As this is a trail period we need residents to take part so that the Council can assess it's benefit at the end of the trial. Please let your Heyhouses Ward Councillors know what you think of this new service. St Annes Square Wins another Award! St Annes town centre has collected yet another award - recognising the excellence of the public realm scheme, which has transformed the main streets in the town centre. The gong is a prestigious Local Government News (LGN) Street Design Award and was presented to the Mayor of Fylde, Cllr Susan Fazackerly today (July 8). The award, was given under category number one of ‘pedestrian environment, which looks at town centre schemes and at pedestrian priority solutions. The judges chose the St Annes on Sea Regeneration Programme as the winner of the pedestrian environment category as they were impressed by the way the project reflects the heritage of the area, whilst providing a contemporary and appealing setting. Laura Sharman, Editor of Local Government News, commented: “The work being carried out in St Annes on Sea is a great example of coastal town regeneration, and should inspire other local authorities looking to improve their local environment. The award itself was established in 1986 and aims to reward innovation and good practice in urban street design schemes undertaken by local authorities. Over 100 entries were submitted in each of the seven categories. Cllr Susan Fazackerley, Mayor of Fylde said: "Fylde Borough Council is delighted to receive this award, which is one of many that have recognised the quality of the regeneration taking place in St Anne’s which will be enjoyed by the public for years to come." Cllr Roger Small, Cabinet Member for Development and Regeneration, added: "The Council is committed to ensuring our parks and public spaces are maintained to a high standard on a day-to-day basis. “We also have an excellent track record at securing funding for regeneration to improve the public areas of the Borough. The current plans for work to restore Ashton Gardens and the War Memorial in Kirkham, as well as completed works to the War Memorial Gardens in Lytham, are just some examples of the care we take of our public spaces." Get Your Kids into a Sporting Summer! Are your Children aged 8-17 years? Fancy something fun to keep you active and make new friends during the summer holidays? Then why not take advantage of a whole host of FREE activities being offered by Fylde Borough Council this August? · 1-3pm – Bridges Playing Fields, Warton * Staining Village Playing Fields * School Lane Playing Fields, Newton * Kirkham Youth Base. · 4-6pm – Mornington Road Playing Fields, Lytham * Lower Lane, Freckleton * Hove Road Park, St Annes * Blackpool Road North Playing Fields, St Annes. · 7-9pm – Park View Playing Fields, Lytham * Kirkham Memorial Gardens * Hope Street Recreation Ground, St Annes * William Pickles Park, Clifton. · 1-3pm – The Pavillion, Weeton Army Camp * Blackpool Road North Playing Fields, St Annes * Elswick Village Multi-Games Area * Waddington Road Field, St Annes. · 4-6pm – Ashton Gardens, St Annes * Fleetwood Road Park, Wesham * William Pickle Park, Clifton * Lower Lane Multi Games Area, Freckleton. · 7-9pm – Kirkham Memorial Gardens * Bridges Playing Fields, Warton * Hope Street Recreation Ground, St Annes * Hove Road Park, St Annes. · 1-3pm – Bridges Playing Fields, Warton * School Lane Playing Fields, Newton * Staining Village Playing Fields * The Pavillion, Weeton Army Camp. · 4-6pm – Mayfield School Field, St Annes * Mornington Road Playing Fields, Lytham * Hove Road Park, St Annes * The Pavillion, Weeton Army Camp. · 7-9pm – Lower Lane, Freckleton * Hope Street Recreation Ground, St Annes * Kirkham Memorial Gardens * Ashton Gardens, St Annes. · 1-3pm – The Pavilion, Weeton Army Camp * Elswick Village Multi Games Area * Staining Village Playing Fields * Kirkham Youth Base. · 4-6pm – Park View Playing Fields, Lytham * Fleetwood Road Park, Wesham * William Pickles Fields, Clifton *Ashton Gardens, St Annes. · 7-9pm – Hope Street Recreation Ground, St Annes * Kirkham Memorial Gardens * Bridges Playing Field, Warton * Waddington Road Field, St Annes. · 1-3pm – Bridges Playing Fields, Warton * Staining Village Playing Fields * Waddington Road Field, St Annes * Blackpool Road North Playing Fields, St Annes. · 4-6pm – Mornington Road Playing Field, Lytham * Hove Road Park, St Annes * Elswick Village Multi Games Area * School Lane Playing Fields, Newton. · 7-9pm – Ashton Gardens, St Annes * Hope Street Recreation Ground, St Annes * Lower Lane, Freckleton * Mayfield School Field, St Annes. High ropes offer challenging outdoor physical activity and offers the chance to take on exciting challenges as well as building new skills and friendships. A High Ropes course will also be at the following destinations from 1 – 6pm. For further details on these August events contact Clare Grant on 01253 658658. The local YMCA are also holding a series of activities, for 12 – 17 year-olds, running daily from July 21 – 25 and July 28 – Aug 1. A full table of times and venues is detailed below. Global Warming - How could this affect the Fylde Coast? New United Nations projections for Global Warming and rising sea levels highlight the vulnerability of the North West and show just why all of us need to do more to conserve energy and reduce our CO2 emissions. Fylde Council has just been accepted by DEFRA as an area for investment for new Coastal Defence improvements. A 9 Million Pounds bid for urgent to the sea wall at Grannies Bay, is just the start of a long list of much needed improvements. This slide shows the impact that just a 1 meter sea level rise would have on the Borough. A 4 Meter Rise in Sea Levels. This projected 4 meter rise in sea levels shown here is a realistic projection by 2050 based on current models. The East of the Borough is most under threat and thought will have to be given to the potential threat to future development in these areas. Some coastal areas of the UK are already experimenting by removing sea defences and allowing old flood plains to absorb the incoming tides, could this be a possibility for the Peninsula in the future? Potential impact of a 8 Meter Rise in Sea Levels. 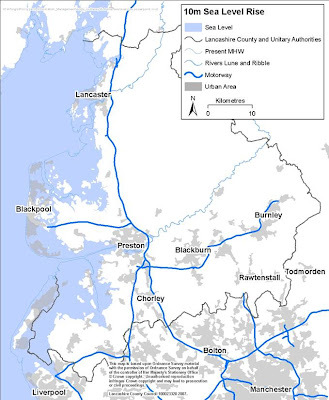 Significant investment has been made all along the North West Coastline from Morecambe down to Starr Gate in Blackpool, yet this slide highlights how difficult it is to protect the inland areas, Lancaster and Preston also being affected. Fylde however is the weak link in the Fylde peninsula flood defences, highly dependent on natural defences, which can withstand a high tide or two, but which would be ineffecive against a prolonged episode due to rising sea levels. The Government and MP's across the North West must increase their efforts to gain funding in light of these new projections and help lobby the Chancellor for additional funds towards Coastal Defence improvements along both sides of the Ribble Estuary. A 10 Meter Rise in Sea Levels would seriously affect the lives of all Coastal areas around the UK. Here in Fylde we are already working towards reducing our energy usage, however, the Borough does have some of the worst residential energy and C02 emissions figures in the North of England. This is mainly down to the age and size of the homes in Fylde and the high % of car usage. The Fylde Low Waste & Energy project (FLoWE) will aim to reduce this usage by offering free advice on energy usage and grants towards home insulation. Whilst this work is ongoing, the Council must take on board these findings and continue to work with all it's partner organisations to help develop the best long term strategies for the Boroughs future generations. Strasbourg, 20th May 2008 -- The European Parliament voted today to maintain EU tobacco production subsidies, contrary to appeals from the Conservative Party. Conservatives MEPs are vehemently opposed to tobacco subsidies in the EU, which cost taxpayers millions of pounds. More than £200 million (293 million euros) has been set aside to pay tobacco premiums in the 2008 EU budget, and an additional £10 million (14,250,000 euros) has been earmarked for the Community Tobacco Fund. Direct payments to tobacco farmers, which were due to expire in 2009, will run until 2012 as result of amendments passed last month in the European Parliament's Agricultural Committee. "It beggars belief that whilst food prices are going through the roof, we are still directly funding tobacco farms around Europe. On the one hand the EU talks about cutting dependency on tobacco, then on the other it sanctions an extra three years of direct tobacco subsidies, whilst virtually all other sectors have moved to an area based payment. "We spend £200 million on funding tobacco, yet only £30 million in the UK on tobacco awareness schemes. The CAP should be supporting healthy products, not something like tobacco. We end up not only having to pay to support its cultivation, but also the huge costs in treating its effects. I am amazed that the Parliament has missed its last opportunity to put a stop to this ludicrous system." Tonight I attended a very informative meeting to launch the 'Friends of St Annes Library Group' hosted at the County Councils Carnegie Library on Clifton Drive in St Annes. The Group is to be formed to help raise 30,000 pounds to refurbish the gardens surrounding the building, the plans have already been drawn up and their completion will help lift what is already an impressive building. The evening was opened with a very informative presentation given by local historian Peter Shakeshaft. Peter's knowledge of the local area, the Library was deeply informative and even as a local lad was amazed to hear the stories of how our Town and Heyhouses Ward in particular were developed in the early years. The Annual General Meeting of the new Firends Group will be held on the 18th June at 18:30 at the Library and all residents are welcome to come along. There is a small membership of just 5 pounds to join the group, I hope that this will be a good cause that residents can get behind. The next meeting of the Fylde Lancashire Local will take place at 7 p.m. on Tuesday 27 May 2008 at the Kirkham Community Centre. The link to the agenda for the meeting is given below. Activities planned for the May half term are as follows so please signpost your children and their schools to these events. There will be a leaflet to promote the being delivered around the appropriate locations in Fylde. The Council and it's partners are keen to ensure that children of all ages have varied activities across the Borough, as we all know keeping the kids occupied during the holiday's can be difficult so we hope that there will be something for everyone in the programme below. Summer Sports outreach will be at the following locations around the area of Fylde. There are some provisional dates for trips to Tower Wood over summer for young people to enjoy. (Outdoor activitiy centre in the lake district)These will be supervised trips and any parent can contact the Council for further details. 1-3pm- bridges playing field warton, staining village playing fields, newton-school lane playing field, kirkham youth base. 1-3pm- weeton army camp-the pavillion, elswick village multi games area, staining village playing fields, kirkham youth base. 7-9pm- ashton gardens, hope st recreation ground, freckleton-lower lane, mayfield school field. Using Section 106 agreements to improve air quality. The case study below shows how by using section 106 agreements Fylde Council will be able to deliver on a number of Environmental Protection policies. Below is a case study relating to Greenwich Council. This study may be of use to Councillors, keeping in mind local concern over Blackpool Airport expansion plans and its' recent sale. Councillors at Fylde are presently being tasked with modernising our own policies in these areas, this process will shortly involve a number of public consultations relating to planning policy development. London Borough of Greenwich Council has experience of using planning agreements – under Section 106 of the Town and Country Planning Act 1990. They have secured several developments where the community has benefited. It includes the provision of affordable housing and use of local labour. “Where it is not appropriate to use planning conditions to address the impact of a proposed development, it may be appropriate to enter into a planning obligation under Section 106 of the Town and Country Planning Act 1990. Make other environmental improvements before a development goes ahead or offset the subsequent environmental impact of a proposed development. In particular – the purchase, installation, operation and maintenance of air quality monitoring equipment or provision of other assistance or support to enable authorities to implement any necessary monitoring or other actions in pursuit of an Air Quality Action Plan” (PPG23, Annex 1)." This guidance has been actively implemented by Greenwich since the first Low Emission Zone (LEZ) controls on the Greenwich Peninsular development. It also forms part of Section 106 legal agreements, signed on 23 February 2004. Achieving air quality improvements through planning obligations is a big challenge. Through LEZ measures and planning guidance documents, Greenwich is standardising the process. Policy E6 seeks to minimise the impact of air pollutants and requires appropriate mitigating design solutions. Policy E7 seeks the provision to mitigate against traffic and vehicle emissions. To seek contributions for these policies in the UDP, a Planning Obligations Supplementary Planning Document (SPD) was adopted on 27 February 2008. Annex 1 in the SPD sets out guidance for deriving planning contributions towards environmental health. A standard contribution will be sought of £100 per dwelling for residential development, and £10 per square metre for town centre and residential developments. A model conforming to S.106 is currently being developed by air quality and planning officers. The aim is to standardise developer requirements to mitigate the effects of air pollution from their proposed development. This model will state the particulars of the Low Emission Transport Scheme together with Low Emission Transport Controls. The construction phase: that is, all heavy goods vehicles (HGVs) and light goods vehicles (LGVs) – 3.5 tonnes and over – shall have emission standards equivalent to Euro 4. The operational phase: that is, introducing a minimum standard of Euro 5 for 100 per cent of commercial vehicles by 1 January 2013 at the latest, with further target quotas for Euro 6 emission standard or clean vehicles. Residential managed parking to ensure all vehicles are Euro 4 standard at the start of use. At least 50 per cent of vehicles to be Euro 5 by 1 January 2011 and 100 per cent Euro 5 standard to be achieved by 1 January 2013. In addition to any monitoring required as part of the agreed code of construction practice, the developer shall agree with the local authority to contribute to the purchase, installation, operation and maintenance of monitoring air quality equipment. Or they need to provide other assistance or support to enable authorities to implement any necessary monitoring or actions in pursuit of the council’s Air Quality Action Plan. The case study below demonstrates what can be achieved through financial contributions with the implementation of low emission measures. In 2006, the council received a major application to develop the Woolwich Town Centre. The plans for this mixed use scheme included 960 residential units, community and or office blocks, retail store, retail, food and drink units, 1,172 car parking spaces and cycle parking. Successful negotiations between planners, air quality officers, the legal department and developers of the scheme ensured that the Section 106 agreement secured improvements in air quality within the designated Air Quality Management Area. an auditing process on the implementation of these measures at five and 10 years after store opening. The proposed completion date for Woolwich Town Centre development is 2010. During this time, other air quality mitigation measures, including a detailed construction method statement will be required. The main challenge that Greenwich faced in achieving air quality improvements through planning obligations was encouraging all key parners (environmental health, strategic planning, legal services and developers) to become involved and stay involved. One tip would be to start negiotiations and preparation as early as possible. It is important that the developer knows what is required by the council to mitigate the effects of air pollution. The LEZ measures and the proposed Supplementary Guidance Document Model S.106 will help to standardise this process. Residents from within the St Annes Town Council Boundary took the opportunity to vote on the 1st May 2008 over the issue of the proposed closure of St Annes Pool. "Do you demand Fylde Borough keep the St Anne's swimming pool open and operational" A simple Yes or No answer was required. A total of 3,040 electors voted in favour of the question; 15 voting against and 3 ballot papers were classed as 'spoilt'. The eligible electorate for the poll was 21,641 which resulted in a turnout of 14.1%. Although this has been an emotional issue the low turnout clearly shows that a significant majority (85.9%) of residents in St Annes on Sea either are not too concerned about the closure or are in support of the Councils actions and it's push to find a cost effective, long term future for swimming in the Borough. It is vital however, that we do take notice of the 3,040 people, mainly parents with young children that took the time to vote. Councillors and Officers have been tasked with ensuring that there is no reduction in School Swimming and that we continue to explore the potential of local Hotel support in opening up their facilities to the local community. I have personally taken charge of meeting with local business leaders to continue to find a possible solution to keeping the current pool open beyond the 31st July. Currently we feel we need to find over £13,000 per month to make this possible and I hope that the comments put forward in the LSA Express this week by Mr Tim Armit spark a revival in swimming in St Annes. The Council is continuing to monitor visitor levels to both pools on a weekly basis. St Annes Town Council hosted, but did not Chair a public meeting recently relating to a number of issues of local concern. A number of people have approached me since this meeting asking for advice and clarification of some of the points raised. Although this was supposed to be a "Non Political" meeting I was surprised to see pressure groups from across the Borough in attendance and mainly Rural Opposition Councillors and Prospective Lib Dem candidates from outside St Annes taking centre stage. I hope that the people present saw through Cllr Hayhursts calls to vote Independent and the Lib Dem's calls for anti Conservative voting. The St Annes Pool obviously gave opposition Councillors an opportunity to knock the Council however, the advice given regarding the current pool site being earmarked in the Local Plan for Leisure, does not mean it has to remain a pool. The Council is still working hard to find an alternative proposal for swimming provision in the Borough, but it will not be on this site. The money raised from the disposal of the site will be ring fenced towards a new facility within the Borough. There was also talk regarding another Parish Poll for a vote against the proposed Shelter Housing complex on St Davids Rd North. Again I feel this would be a waste of taxpayers money. It is interesting to know that a local Lib Dem Councillor was heard telling fellow Councillors that he agreed that "the facility was needed, just not in St Leonards Ward, It should be situated in Central Ward!" This new facility will have a Management Board made up of Councillors and hopefully some local residents that will ensure that the scheme is run effectively. I hope that in the near future the Council will be able to inform local residents, who will be accommodated at the project and the guidelines for the facilities operation. Lib Dem prospective Candidate Prof Winlow addressed the meeting to talk about the Council asset stripping and "selling the family silver" I wish someone would have told him that it was the Independent and Lib Dem coalition that started the Town Hall re-generation project and that the asset disposal would fund it! Surely he must agree that having adopted this policy in 2003 Conservatives have to see the process through? The debate moved on to the Democratic defciet within the Town Hall, again leading opposition Councillors making political statements, without informing the public present of the facts. Facts such as, on taking control of the Council in 2003 the Conservatives set up a Joint Executive Committee (Cabinet in all but name)This committee was comprised of 5 Conservatives and Hayhurst, Oades, Longstaff and Rigby all of these Leaders of Opposition groups. Consrevatives tried hadr for 12 months to make this committee work, however, certain individuals used their position to undermine the Council and deliberatley made the operation of the Committee difficult. Conservatives had no choice but to move to a single Party Cabinet - but we tried! I am 100% convinced that the same offer would not have been made to Conservatives, had the shoe been on the other foot. Readers should also note that Liberal Democrats National Party Policy is to push for Unitary Authorities to replace the current two tier system. This therefore supports the Cabinet Structure of Governance. Lib Dem Councils across England operate the Cbinet system. 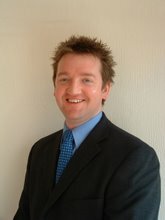 At Fylde Conservatives had placed opposition Councillors in leading roles within the Council. There were many negative comments made such as "residents should be urged to make Councillors lives a misery and work against them" and that "Mr Moor would head up the Civic Awareness Programme to help find Independent Councillors to fight Conservative seats"
I'am saddend that yet again by politicisation of St Annes Town Council and Iam duty bound to ask whether it is appropriate that Parish Precept funds are being used to support these meetings? Conservative Councillors have been working hard on many issues across the Borough, with the total support of many genuine interested groups. Can I just add that comments were regarding the exclusion of the Chair of St Annes Town Council to the Swimming Summit - this statement is misleading. The portfolio holder was told that Cllr Oades was attending the Summitt as the representative of the Town & Parish Councils. I made it very clear that if this was the case then fine, however, if it was not, then all Parish Council Chairs should be invited. As no "decisions" were being made at this meeting, the attendance list was made up of those groups that could help formulate the Councils future plans for Swimming provision. There was a discussion regarding parishes and again I believe an offer was made to help Lytham set up it's own Parish Council. For information Conservatives have been working to this end for over two years! former Conservative Councillor Ray Norsworthy Chairs the Lytham Forum, this group being made up of interested groups from across Lytham and Ansdell. The forum has has been working closely with Fylde Council to investigate the pro's and con's of having a Lytham Parish Council. They are keen not to repeat the weak models adopted by both St Annes and Kirkham Town Councils. Parishe Councils across Fylde work very well with Parishes taking responsibility for a number of services for their local areas - St Annes and Kirkham have shied away from these responsibilities in the past - Hopefully the new possibilities presented to parish councils, thanks to the implementation of "Differential Rating" may jolt the Boroughs two Town Councils into taking on some responsibility. Readers may be interested to know that the whole Differential Rating debate was borne out of the work done by the cross party joint committee in 2003 and the insistance of Cllr Hayhurst that the former system was "unfair and creating a rural/urban split" so often was this argument put forward by the Former Council Leader, that extensive work was done by the council with parishes to find a solution. The former system was unfair. Surprisingly Cllr Hayhurst does not play the Rural/Urban split card any longer. I was surprised that the Town Hall project, although on the agenda was skirted over? Can I just lay one myth to rest once and for all. The Government finally announced in December 2007 that it was shelving any further plans for Local Government Re-Organisation. Therefore Fylde Council will continue for the forseeable future. With this in mind the Council has to ensure that as an employer it meets it's obligations regarding Staff working conditions. The current Town Hall cannot be used by the community, the new project will open the building up to all. With the Council developing it's plans for a "Classic Resort" the decision to conserve the Heritage of the town, including and finnancial benefit to the Tax Payer of modernising the Town Hall, should not be underestimated. Finally Comments were made about the streamlining of the Customer Contact Points within the Council and in particular the closure of the Kirkham One Stop Shop. This closure was done as part of a modernisation programme for this service. A concern was made relating to "How will residents pay their Council bills"? The simple answer, at the Post Office! The Council is keen to support the Post Offices and the additional foot fall at the Kirkham Office, I'm sure will be welcome. I hope that this item has put the record straight on a number of issues. It is so easy for residents to be mislead by people that should be telling them the truth on such important issues. Conservative councillors have always strived to be open about the decisions it makes and why, this blog shows that there is nothing to hide on any of these important issues. Residents just have to ask. This week Councillor John Coombes welcomes back RideSafeBackSafe to Fairhaven Lake and Gardens. The event is run by the Lancashire Partnership for Road Safety and the key message is to promote road safety. The event attracts a large number of bikers and spectators. The event is open to all and last year attracted over 7,000 both regionally, nationally; as well as holiday makers and residents. John Coombes added " Although this is a fun event there is a serious message attached to it - that of using your motorcycle safely and getting home as a result. Last year I decided to take the Institute of Advanced Motorcyclists (IAM) course through South Lancs Advanced Motorcyclists Group, I learned a great deal about road craft, which is a key element of the course. After falling off my machine in December and suffering a broken collar bone, it highlights why we two wheel fans have to respect the road!" Fairhaven Lake has become the home for the RideSafeBackSafe event and Fylde Council hopes to build on it's success by increasing the event each year by inviting more local and National Motorcycle Clubs to come to the Fylde Coast to hold their events. An action-packed and informative bike show, featuring Maria Costello, the fastest woman at the TT. Stunt performances by Dave Coates, Xtreme Trials Display Team, MPC Urals and Zero Gravity Freestyle Trials Team. The Council is keen to ensure that it's policies are up to date and encourage local residents and buisnesses to use alternative sources for power generation. Following the Climate Change and Sustainable Energy Act 2006 and the Microgeneration Strategy 2006 the new Statutory Instrument became Law on the 6th April. The Permitted development Rights for microgeneration installations however, do not extend to Listed Buildings. Fylde Council is keen to see Fylde become one of the Greenest Boroughs in the Country and through the change in local planning policy hopes that this relaxation of planning rules will help Councillors develop new local policies during the year. Micro Wind due to legal technicalities the current Statutory Instrument does not cover Micro Wind. The noise concerns with this technology mean that compliance with the Microgeneration Certification Scheme (MCS), or equivalent, will be a prerequisite for Permitted Development for both product and installer. Use of the MCS requires the Government to notify the European Union. This will take place as soon as the legal drafting of the new SI is completed. There is no way to determine how long this process will take, perhaps this Summer? The Council needs to consider these in particular as I feel there may be significant local intersest in turbines in particular as a possible source of residential energy in the future. Biomass and CHP Boilers or Stove will also now be permitted in residential or commercial developments enabling residents to use green fuels. The only restrictions to consider will be if the flue exceeds 1 meter above th roof height or is installed on the principle elevation and visible from the road in Conservation Areas. Ground Source, Water Source and Air Source Heat Pumps will be permitted. A meeting is taking place this week to discuss the future of swimming provision in Fylde. This wide-ranging discussion has been scheduled for a couple of weeks and will involve councillors alongside the local MP, members of the business community, the YMCA and Friends Representatives. “Local people and businesses are now very focussed on swimming in a way that hasn’t happened before. This meeting is a chance to discuss a number of options, including the feasibility of another site, in an effort to ensure that local swimming continues but in a cost effective manner“. The tough decision taken to review the future of the pools has been the right one as what it has now done is focus all aspects of the Community and the Council on finding an alternative solution. Not surpisingly, Politcal opponents have taken the opportunity to launch a nasty campaign to undermine the whole "feasibility for a new future for swimming" in the Borough, by focusing on the closure and not telling residents about the Councils pledge to put all it's focus on finding an alternative long term, viable option. However, those people that have taken the time to dig further than the local newspaper headlines and scurrillous political leaflets, admit that the current facilities are not viable and that the Council is right to draw a line in the sand and to halt the £500,000 subsidy the two facilities swallow each year. The Heyhouses team hope that the meeting will bring forward a positive plan which everyone can support. The outcome of the meeting will be made public and Fylde Borough Council will be consulting local people on the possible options being considered. The annual inspection and audit of Fylde Borough Council has now been completed and compliments the authority in the continued improvement of services in areas it has identified as priorities and which the public say are important. The report, carried out at every Local Authority, provides an overall summary of the Audit Commission’s assessment of the Council, drawing on details from an audit, inspection and performance assessment work. It says that since 2002/03 the extent of improvement at Fylde has been above the average of all district councils. It particularly compliments the strong performance in environmental services, which has achieved its 40% target for recycling of household waste three years early and continues to improve. It also notes that the local environment is maintained to a high level, reflected in street cleanliness, green flags for local parks and the international LivCom award for Lytham. Work undertaken directly and with partners to make a positive contribution to the wider community is also singled out as worthy. The Fylde is one of the safest in England and all community safety indicators in the lowest 25 per cent and the report notes the Council’s positive contribution towards keeping it that way. Cllr John Coombes, Leader of Fylde Borough Council, said: “External audit and inspection is an essential element of accountability for public money and how it is used. What this report shows is that, as a Council, Fylde is improving year on year in most areas. This conclusion, from an impartial source, reflects the hard work of councillors and staff and is very encouraging news for local residents as it tells them their money is being effectively spent. The strong systems in place for performance management and the robust plans for improvements linked to corporate priorities are also noted within the report and the scrutiny function which analyses decisions made by the Council is also singled out as working well. The report goes on to compliment the Cabinet system, for its strengthening of governance arrangements and member accountability in decision-making, and for speeding up the process of change and improvement. Cllr Keith Hyde, Chairman of the Councils Performance Improvement Scrutiny Committee said " Iam delighted that the Councils Scrutiny Processes have been seen as performing well. Opposition members have tried to criticise the work we have done adn this has been vindicated. With Local Councils from across England contacting Fylde and asking us to help them with modernising their own Commitee functions I am proud to say that yet again the tough decisions taken in the past have been the right ones - we might have had to drag some Councillors screaming an kicking into the 21st Century, but the residents will have a stronger, more accountable council as a result"
Financially, the report recognises that the Council has the financial capacity to deliver its plans owing to the updated Medium Term Financial Strategy; it also notes that external funding has been successfully used to address local priorities but does note the Council will face "significant financial pressure in 2008/09". The report does note weaknesses in some areas, such as planning and benefits – but says that these are being addressed, resulting in improvements between April and December 2007. It also notes that, although vast improvements have been made in promoting equality and diversity, the number of Council buildings which are suitable for and accessible to those with disabilities needs improving. Cllr Coombes continued: “The report clearly shows we are moving in the right direction, concentrating on the areas that matter to the residents of Fylde. Our next steps will be to take the actions recommended by the report and dedicate resources to ensuring any weaker areas are improved to offer residents even better value for money and quality services. insisting the county is getting all the transport funding it needs – despite creaking roads across Fylde and a catalogue of unfinished projects. Bumbling Mr Brown astonished Lancashire's leaders by claiming the county's transport network is getting BETTER and the area is getting all the funding it needs. Official Treasury figures reveal in 2006/07, the North West was handed £276 per person in transport funding – compared to the £319 per person UK average and the whopping £614 per person funding enjoyed in London. Mr Brown told the Lancashire Evening Post: "I don't think it is true to say that transport spending has been skewed to one particular area. "In every part of the country we are spending (on) transport according to the needs of these different areas. "We are doing a lot and we will continue to do a lot. been moving forward with a great deal of speed." The Prime Minister made the claims during a questions session at 10 Downing Street. He replied: "We are investing in every part of the country." He said: "So we are moving forward." The claim stunned the county's transport campaigners and MPs. He said: "How the blazes can it be parochial when there are millions of people using that stretch of motorway every day?" Aiden Turner-Bishop, from the Preston branch of the Campaign for Better Transport, said there were plenty of "simple things" which could be done to improve transport. He said: "The Prime Minister says it is all done 'according to need', but who decides what our needs are? "It should not be some civil servant in Westminster – give us the money and let people in Lancashire who know our needs decide." Preston Chamber of Trade chief executive Nicholas Watson said that the transport links into the city centre were "crucial to the economic survival" of shops. He said: "It was 50 years ago this year that the Preston Bypass became the first section of motorway in the country, and we are still waiting for those missing link roads to connect our city centre to that motorway." Mr Brown's comments come just days after Lancashire County Council's ruling Labour leader Hazel Harding claimed there was a "north-south divide" in road funding. She said: "We do not get necessarily what we ought to in terms of our share of the pot." Fylde Tory MP Michael Jack, said: "If (Mr Brown) has the odd five hours maybe he would care to reach our part of the North West by driving along the M6 motorway." But Preston's MP Mark Hendrick said: "Everybody is getting more. "I find it a bit strange, coming from Hazel (Harding), an impression that Lancashire is not getting its fair share." Thought it would be of interest to put this one on the Blog when Fylde's road infrastructure in particular is crumbling with a desperate need for many of the Rural Moss Roads to be upgraded and the local desire for the new M55 Link Road across the Moss in St Annes. 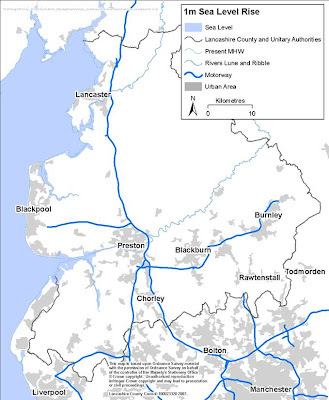 It is also ironic that the PM's comments come within a fortnight of this Minster informing Fylde, Blackpool & Wye Councils that the Governmetn was not minded to support our call for a new motorway junction (the Blue Route) close to Jnc 4 on the M55. This new exit would be a welcome relief to the Singleton village area and would ease the building congestion problems being experienced by Fylde Coast residents trying to get to North Blackpool or Fleetwood. I agree fully with the Labour Leader of Lancs County Council that there is a north/South divide when it comes to getting our fair share of funding from Government. 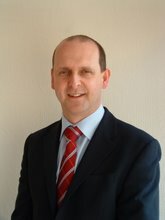 Residents may know, Fylde Low Waste and Energy (FLoWE) was set up some time ago by the Rt Hon Michael Jack MP to help every sector of Fylde Borough’s society to reduce energy consumption and in so doing reduce their costs while helping the environment. Hosted by Fylde Borough Council, in the year that the new Project Manager, Andrew Loynd has been in post, he has been involved with many initiatives, partiuarly with local schools (20 recently attended the FLoWE Schools Eco Conference held at Lowther Pavilion), instigated a process of improving the council’s efficiency through working with the Energy Saving Trust, small projects with Fylde’s LSP and recently started engaging with businesses through a letter included in the business rates. FLoWE is now in the position to start directly working and benefiting the wider population throughout the Fylde Borough area, being led by a new website providing local information and a pledging scheme. For those who do not have access to the internet we have produced pledge cards that they can fill in and return to FLoWE and in return receive an information pack which will include all relevant information. It is intended that this site will evolve into a useful long-term community resource which will be supported by a series of regular (possibly twice monthly) roadshows spread across the Borough where people can come and receive specific energy efficiency advice and assistance. To help in the development of this site, please could you firstly go to www.MyFyldeCred.co.uk and make a pledge of your own? If possible, please then forward the message below onto any contacts you have as individuals, businesses, schools and other organisations can all make their own pledges and obtain information that will benefit them. Over 60? Get your free bus pass NoW! Free bus travel is already available within Fylde Borough’s boundaries to people aged 60 and over as well as to eligible disabled people. However, from 1 April 2008 a Fylde concessionary travel pass holder will also be able to travel free of charge on any local bus service anywhere in England after 9.30am on weekdays and at anytime of day on weekends and Bank Holidays. If you already have a concessionary travel card you will not need to do anything to get your new NoW card as this will be automatically issued and sent in the post. The only exceptions to this are if you have a disabled pass, if you have not used your card, or if the photograph on file is not of suitable quality but you will be contacted directly in all these cases. If you want to register for a card and are a new applicant, you can apply via the Council’s One Stop Shop at 292 Clifton Drive South in St Annes. Residents will need to complete the form and also supply a recent colour, passport-style photograph alongside proof of address (eg. utility bill) and proof of age (eg. birth certificate; passport). Staff at the One Stop Shop will be able to check your application and send it to Lancashire County Council who will issue the pass via the post. Please note that cards will no longer be issued via Age Concern. Unsurprisingly the Liberal democrats have taken the opportunity to link up with Local Anti Conservative Groups and Independent Councillors to Launch their General Election Campaign - the recent FOCUS leaflet put out Ashton Ward highlights two things. One, that Prof Winlow the Lib Dem Prospective Parliamentary Candidate has taken to writing the misleading information being put out and Two, has taken on the role of Co-ordinating anti Conservative Groups across the Borough. Independent Councillors in Ashton Ward have joined forces in developing a joint website with Lib Dems, so proving that they are not Independent at all. The Leaflet is deliberately misleading and shows just why Fylde Borough Council ended up as one of the most failing Councils in the Country after 12 years of Lib Dem and Independent Control. It has taken Conservatives over four years to turn the organisation around, having taken the tough decisions needed to secure the long term future of the Boroughs award winning facilities and services. The Lib Dem leaflet states that Conservative Councillors did not protest at the Closure of the Pools, this accusation is a lie. All Conservative Councillors have been against the closure of the Pools, however after two years of attempting to involve the Private Sector without any success they agreed the pragmatic approach, that it would be more beneficial in the Long term to retain Kirkham pool for 12 months, thus allowing local Schools to continue School Swimming Lessons whilst the council involved as many National Organisations as possible to help with a feasibility study into a new Leisure Facility in the Borough. This facility if, purpose built, would be of more interest to a Private Sector operator. This would remove the half a million pounds per annum burden on the Council Tax Payer. I personally met with some School Headmasters and parents regarding this issue and was told that if one pool could remain open then that would be better. Rather than shutting both Pools Conservatives found a way to retain one. The Council is also in consultation with the Six Hotels in St Annes which have Pools open to the public. I hope that these discussions will see the Hotels, following the Parkwater's lead in hosting swimming lessons. The Conservatives are also proposing to launch a new Leisure Card which will hopefully lead to reduced fee's for swimming and gym membership. Technology is currently being tested by Bracknell Forrest Council on behalf of the Local Government Association. If the trail is successful Conservatives are keen to see the card used to give local residents a Discount when using the Councils owned Pay and Display Car Parks. As part of the Budget setting process we consulted with Local Chambers of Trade, asking them to comment on the budget and whether thought it was the right decision to reduce heavily subsidised facilities, opting for better, more flexible alternatives enabling the Council to direct it's ever reducing budget onto more urgent issues - they agreed that the Council needed more focus on Town Centre re-generation schemes, job development and tourism. 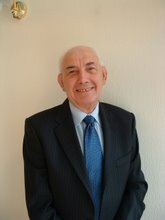 At that meeting was Mr Arnold Sumner the Chairman of St Annes Chamber of Trade - Mr Sumner also agreed with his colleagues. I was surprised, that the next day, he went out and set up the campaign to keep the St Annes Pool open - surely you cannot represent the Local Business Community one day and then go against that view the next?? Forgive me but would it be cynical of me to think that political interference has now infiltrated the St Annes Chamber of Trade? After the Conservatives have managed to attract over 9 million pounds of funding to St Annes in recent years, surely that by politicising the Chamber of Trade Mr Sumner threatens the good relationships that have seen partnership working the success it has been? In their leaflet the Lib Dems have admitted that they would continue to waste 500,000 pounds per annum in keeping open under used and out of date facilities, rather than take the tough decisions to close or modernise them. AT LAST AN ADMISSION. The Government CPA Inspection in 2003 almost led to the Council being taken over by whitehall Mandarins - The report was scathing of Lib Dem and Independents Councillors and their lack of conviction and their 'head in the sand approach to running the Council'. Their failure to take difficult decisions and plan ahead for fundamental items such as facilities maintenance was a prime example of how they managed to squander almost 12 million pounds of Council tax payers money. This money came from the sale of the Councils Housing Stock - it was wasted on keeping Council Tax levels the lowest in Lancashire. With no reserves left and buildings falling apart, Conservatives have had no option than to Re-structure and start again. In their leaflet Cllrs Ford and Henshaw call for resignations - I agree with this sentiment entirely - Councillor Henshaw's financial advice has played a massive part in the Councils financial decline - They say in their leaflet that Conservatives ignored their suggestions, Rubbish!, their proposals were unrealistic, uncosted and did not stand up to the rigourous rules required to balance a Council budget. The Lib Dems ask for resignations, Henshaw should go, as should Cllr Hayhurst, the former Leader of the Council who steered his coalition to disaster. The Lib Dem 'Lies in Focus' leaflet also mentions the new 'Open Spaces Maintenance' element now listed on Council Tax Bills. Since 1974 residents in Rural Parished areas have been paying twice for their open spaces upkeep. Once on their Fylde Council Tax bill and then again through their Parish Precepts. This is because Parish Councils (other than St Annes & Kirkham) have taken over the responsibility of looking after their own parks and open spaces, yet the Council only paid them back a small proportion of the Council Tax for doing it. Again Lib Dem and Independent Councillors have ignored Parish Councils pleas to rectify this injustice - the Conservatives consulted over two years with Parish Councillors and won overwhelming support for the standardisation of the Council Tax. The line 'Open spaces Maintenance' on Bills in Lytham St Annes and Kirkham would simply be added to 'Parish Precept' line if those Parish Councils took on the same responsibilities as the other 13 Parishes in the Fylde. Conservatives have asked repeatedly for a Lytham Town Council to be started and for St Annes and Kirkham Town Councils to step up to the plate and do the jobs they were elected to do - both to date, have declined. St Annes Town Council raises 41,000 pounds from St Annes residents each year, their sole responsibility - Shepherd Road allotments. The Town Council has been taken over by pressure groups, with axes to grind, rather than representing St Annes residents. Readers will remember that some stood on a dual ticket at the last local elections, some Labour candidates others Lib Dems. The up and coming Coronation of Cllr Ford as the next Chairman of the Town Council will ensure that the Lib Dem's can use your 41K per annum for their own political means. I would suggest that unless the Town Council in St Anne's agrees to take over open space management this year, then a public petition should be started to disband it. The 41,000 could then be returned to Tax Payers. I urge residents to look past the Political opportunism of the Lib Dems and think about all the things that have been done in the Town in recent years. Conservatives have big plans for the Borough and many announcements to come, will prove that some of the bitter pills taken today will benefit the long term health of the Borough in the long term. Most residents of St Annes on Sea will be aware of the succesful Fylde Coast Bike Meet which attracts hundreds of Motorcycles every Monday night to the Square. This Bank Holiday Weekend kick starts the Bike Meet season and Cafe's and Restaurnats in the Square can expect a large turnout this Bank Holiday Monday. The meet was organised to try and attract additional business to the Fylde Coast in particular the many new shops and restaurants whom have set up their business in St Annes. I hope that all Fylde Coast Bike owners will turn out on Monday the 24th March - Lets hope it's a Great Biking Summer!! • take more than a specified number of dogs onto land. We are keen to ensure that we continue to fight 'Crime and Grime' in the Borough, but we need your help. The majority of dog owners act responsibly when out with their pet but, there is always a minority that brake the rules. If you have any concerns about a particular piece of land or highway that is constantly being fouled, then please contact one of us and we will ask for Officers to monitor the area.